Socks is my kitten, he is white and brown. His ears are brown and his fur is white. His tail is brown. He is a very crazy kitten! Socks is 11 weeks old and he is so cute. He can go outside but you have to watch him because he might eat a rock. He sleeps, plays and has fun. He sleeps on beds and he licks your toes in the night but it does not hurt because he has baby teeth. He is the cutest kitten ever because he is so fury. Since the holidays have finished class 12 is now in class 11’s old room . Some people had to change lockers including me . We don’t have groups , we stay with our class. We have a disco today and next week we have a trip to London . Our new topic is Ancient Egypt , we are learning about mummies for a few weeks , we are writing how mummification works . We now have Maths spaces , English spaces and horseshoe spaces, these are basically carpet spaces but at tables and at a horseshoe which is basically a horseshoe shaped sofa . In my family, I actually start Easter on Good Friday, which is today. My mum and brother (and sometimes me) go on a walk called the Walk of Witness and at the the end you eat a hot cross bun. We also hang out and remember the last supper. We have a special tea which is lamb and turkey. On the Saturday we go to my grandma and grandad’s house and have dinner. Finally the next day it is Easter and we get a few presents and chocolate eggs. The true meaning of Easter is not a time just for chocolate, it’s a time to rejoice and think about the Easter story. I will tell you that it all starts with Palm Sunday when Jesus arrived in Jurusalum and people waved palm leaves. They put them on the floor like a carpet. This is why we have palm crosses and get them in church but a few days later Jesus had a meal with his friends (the disciples) which was called the Last Supper. Jesus broke bread and said it was his flesh. He drank wine and said it was his blood. This is why we have communion but he also said that one of his followers woud betray him. Then on the Friday one of his disciples called Judas did betray him. They led him right to Jesus where he was praying in a garden. Then people accused him of crimes and were shouting to crusify him so they put him on a cross to die. Then they put his body in a tomb and sealed it with a stone. On the Sunday his body was gone and Jesus had come to life. 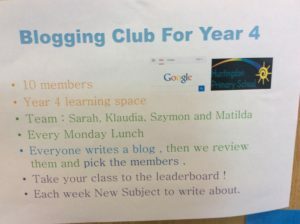 What is the blogging club ? This poster is in class 11 . As you can see this club is only for year 4 .We need exactly 10 members . 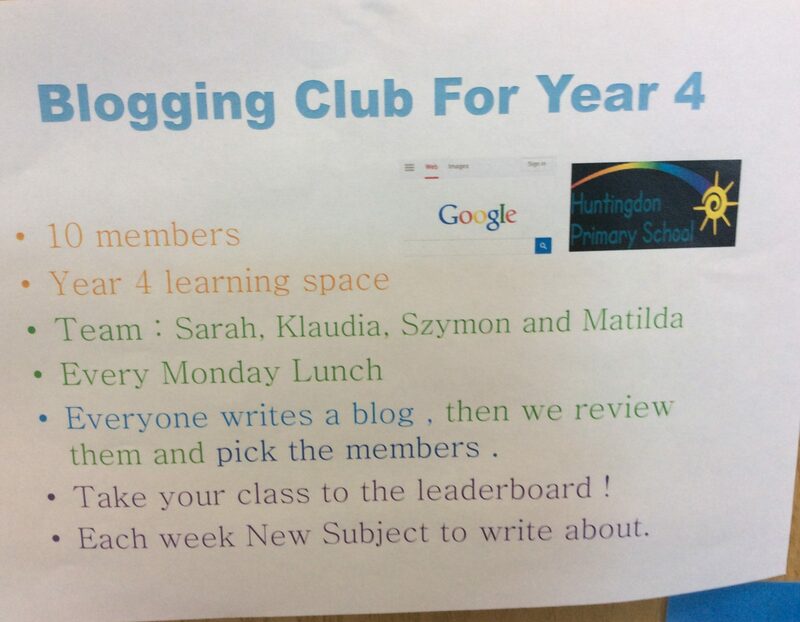 Please talk to myself , Matilda ,Szymon or Klaudia if you are interested in joining us. Thank you. At school we use an app called Seesaw in our class . We Post our work on there. Our parents can see that work on Seesaw family . We get green comments if we did something that we can improve. Pictures of what we do in P.E are also on Seesaw .We scan codes to get on to Seesaw . The codes are different because each one represents a different year group . We get different accounts with animals as our logo , I’m a rabbit . Musical.ly is an app where you can have fun and be yourself . You can find your friends like I did . You can choose from these categories : Style , Talent , DIY / HOW , Comedy , Food , Animals , Sports , Vlog , Gaming , Visual Art and Music . There are hashtags like #SpoonFrogChallenge , #FakeEscalatorChallenge , #BouncingChallenge and more . You can create your own hashtags , I created #FrontflipWithTheCamera and #FallingOnATeddyBear. Me and some other people in year 4 go to interventions . Every Monday while everyone is doing assembly we come as a group and solve hard math riddles .We have assemblys right before break time . The hard maths is so hard that sometimes the teacher has to help us . The host is Mrs Delaney ! 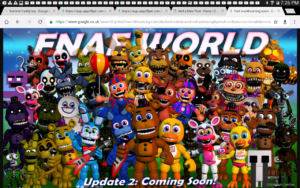 FNaf world is a game on the playstation. When you start out, you start with 8 cute robots called Freddie,Bonnie,Chica,Foxy,Toy Freddie,Toy Bonnie,Toy Chica and Mangirl. There are 48 robots in the game but because you start with 8 robots you have 40 more robots to find. 8 robots in the game you have to get from mini games. I’ve got 1 of them. I got nightmare BB for getting 3 A’s in a row and I’ve Jack-o-Bonnie from getting 1 A in a mini game called Rainbow Sunlight. Sneak Peek Of World Book Day At H.P.S ! Today after school I am going to Klaudia’s . Klaudia is my best friend since Year 2 . I am going to stay at Klaudia’s till 8pm because my mum has to go to work . After that my mum will pick us up so Klaudia can come to my house for a sleepover , I put a padlet on Edmodo about what to do with your friends . Me and Klaudia are going to paint our nails at mine . What do you do at your friend’s house ? Me and Klaudia are going to have fun with slime . Me and Klaudia are also going to watch “I Am Frankie” . Frankie is the newest TV show on Nickelodeon , today is the last episode . Me and Klaudia are probably going to make slime ! We might even FaceTime one of our other best friends , “Szymon” . We might make Musical.ly’s , YouTube videos and even some LIKE videos , if you don’t know what the app LIKE is , it is something like Musical.ly , you can post videos , add special effects and do much more . When did you last go to a sleepover? What is your favourite sleepover ever?